Leirtrim: back on the field in 2019. AFTER A DISASTROUS 2018, Leitrim’s first priority in the Lidl Ladies National Football League this year will be getting a team on the field. They didn’t feature in the Connacht or All-Ireland intermediate championship last summer after a difficult league campaign which saw them relegated to Division 4 on zero points after conceding five walkovers. 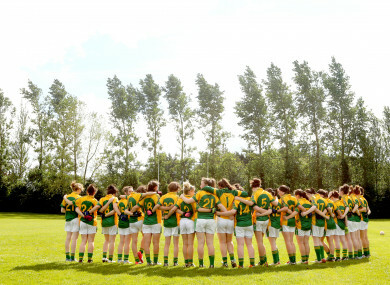 Without a manager and struggling for numbers, their county board obtained a dispensation from the LGFA not to field which resulted in further consequences. With Sligo native Gavin Cawley appointed as manager last week, some form of normality has returned but he’s well aware of the challenges that lie ahead. Cawley, a former Sligo men’s county board PRO, is the current IT Sligo Ladies’ manager and has no shortage of management and coaching experience with DCU teams in the past. “We put a structure in place of where we’d like to see things going forward for Leitrim,” Cawley told The42, explaining that the recently-formed new county board originally got in touch with him. “We’re all aware of what happened last year. It was disappointing, not just for the county team but for the county champions, St Joseph’s… back-to-back county champions at senior level and St Francis in the intermediate. New Leitrim manager Gavin Cawley. He continued: “It’s not going to be easy, I’m under no illusions. Antrim now on Sunday, probably just having met the players three times before playing our first competitive fixture. In that sense of the word, not ideal. That said, it is all about rebuilding and getting Leitrim ladies football out of the doldrums. Especially considering they were back-to-back Connacht intermediate champions in 2015 and 2016, All-Ireland quarter-finalists in 2017 and champions in Croke Park as recently as 2007. “Anything’s going to be better than last year considering they didn’t play competitively in the championship,” Cawley concedes, looping back through their demise. “The league is going to be about getting the team back to basics and getting back on the pitch. Hopefully we can have a good league campaign and focus then on the Connacht championship. There’s been some great battles between Sligo and Leitrim over the years. “We play Sligo later on in the year and I suppose there’ll be a bit of added pressure,” he grins. He won’t look that far ahead just yet though. Catching players’ interest and getting numbers back on board from across the length and breadth of the country is the main focus right now, and it seems to be going to plan. While some players can’t commit with work and others — namely Áine Tighe — are injured, time will tell as the Connacht county look to blend youth with experience and get back on track. “There’s quite a number of the minor team in training with us at the minute,” he continues, “We’re trying to get them to gel with the older players. Cawley, who’s based in Sligo, coaches two ladies teams with the IT and their respective championships are starting up at the minute too. Hectic, he smiles but it’s all enjoyable as pre-planning is absolutely key. “I have to focus on Leitrim at the same time, the league and hopefully we can give it a big push over the next couple of weeks,” he concludes, before referring back to their opener against Antrim on Sunday in Belfast. “I don’t know what really to expect. Antrim, I suppose they won’t know what to expect from us after not playing for a year. It’s going to be an interesting tie. Email “'Anything's going to be better than last year' - Leitrim back after championship absence”. Feedback on “'Anything's going to be better than last year' - Leitrim back after championship absence”.